While maintaining twists, how can you prevent the ends from getting tangly (scraggly)? How often should you trim while wearing twists? Trim as often as needed rather than on a set schedule. (See this post.) Trimming on a set schedule reduces length retention in my opinion and experience. When is the best time to start pinning them up? I'm noticing that I'm losing some length due to damage at the ends, though I've been wearing my hair in twists as a protective style for the past few months. Ideally, you want to start pinning up twists when they are long enough such that the style is effortless and does not cause much tension on the scalp or ends. For me, that "comfortable" length was APL stretched. Damage at the ends can result from a number of sources: pinning up the twists too early, leaving the twists in for too long, impatience during the twist takedown, improperly taking the twists down (i.e., pulling them apart from root to tip = bad), dryness, etc. 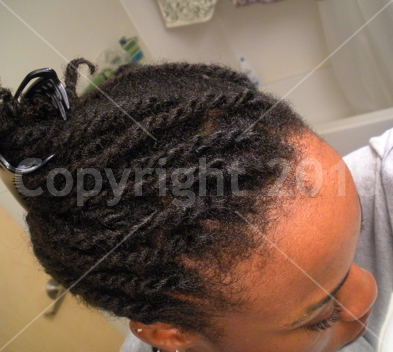 hmm, well i guess my follow up question is at what length should you start wearing twists for length retention? i have about eight inches of hair all around and any time i try to do twists, it just looks ridiculous if i don't pin it up into a style. should i just refrain from doing twists until i get more length? I love your twist series. I have been wearing my hair in twists for months now. I havent seen much growth, but I have retained what I had even with my random trims and search n destroys. I have a routine now that I am trying to stick too and hopefully I will start to see growth. Thanks for all your great post on twist! Thank you for taking the time to write this post.It is very halpful. Can I post this on my blog, if you do not mind? Yay! Thanks for answering my questions in this post. I've also referred others to your site! You're so very cool Loo! So glad word is getting around on this fab series. You know some of the advice you give is sensible but can be seen by controversial. For example minimising the amount of wetting to ensure less tangles...........very eye opening stuff. I feel like we are obsessed by moisture in the natural world. I am adjusting my thinking all the time. A BIG thank you, Jc! And thank you for the references! Yep, I totally agree about the controversy; I tend to rebel against what many of us accept as "basic truths" because ... well they aren't basic truths for my hair. Lol.